The client is a leading group of radiologists based in the Caribbean. The client was looking for a reliable service provider who could automate the STAT processing. The client had adopted a new online software which would simplify the process of teleradiology for the client. The software automated various reports including X-rays, CT scans, MRI scans, etc. It allowed the client to quickly upload the reports and the doctors to check them instantly and suggest further treatment measures. The client was looking for a partner who could work in their time zone and process 200 STAT reports in a month. The client was extremely delighted with the results delivered by our team. By outsourcing to us, the client was able to save on operational costs by almost 40%. The client was not only happy by the quality of services we delivered within a quick time but also the cost-effectiveness of the entire project. Outsource2india has been a pioneer in providing high-quality teleradiology services and a host of other healthcare services to clients around the world. We have been in the industry for over 20 years now, and have gained enough experience to cater to the varying needs of the client. We can be a reliable partner for you and help you achieve your business goals in a short time. 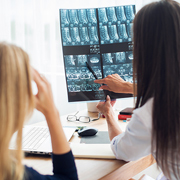 If you are looking for a reliable, quick, cost-effective, and efficient teleradiology service provider, then look no further. If you have a similar project requirement, then feel free to get in touch with us today!